I’m retiring my beautiful trophy of a hammered dulcimer. Her name is Jaina. She was named many years ago and her name means “God is Gracious”. She was named that because when she came into my life I needed a ton of grace. But she is being retired. She’s worked hard over these last 4 years of touring, recording, transformations, experimentations, dings, dents, and touches. She sings like nothing else that’s for sure. You see, wood is still living even though it’s cut, sawed, sanded, polished, and then played on. As it gets vibrations going through it, it grows and absorbs. It resonates and rings. It smooths out and then, it really starts to sing. 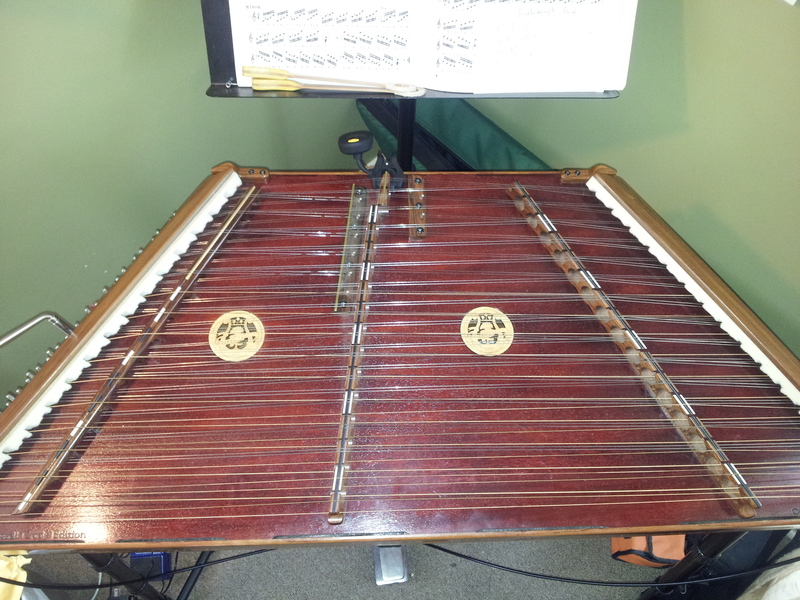 Russell Cook, great builder and great friend of mine says that the new hammered dulcimer sounds the worst that it ever will when it’s new. I believe it now that I’ve lived it. I hope that I sing and sound like Jaina after life beats me up, brings me joys, and makes me sing. I hope that I don’t grow cynical and hard because of it all. I hope that I sound better to others and enrich their souls as I get older and more used up. Maybe filled up would be a better description. So let me back up a little. I said earlier that I needed much grace when Jaina came into my life. The short story goes like this. 10 days before Donna and I were to leave for Winfield, KS to the Walnut Valley Festival and compete for the national title, I got fired from my day job. This was fall of 2010. I’d been working at the business of music and art for almost two years by this time and we were thinking that if I only held on for one more year then maybe I could try the full-time thing. So in the midst of all the hope and joy of doing what I loved on the side in hopes of one day doing it full-time, I messed up and thought it was the end but in reality it was only the beginning. I wanted to fold my hands, stay home, and wonder how I could have been so stupid as to ruin it all with one little email. But I soldiered on and kept preparing for the contest and God was gracious to bless me with a win and a wonderful new trophy and instrument to remind me of His graciousness to me. Not to mention a new way of life. So now Jaina has been drug around the US making music with me for over 4 years now and we’ve had a great run but it’s time to set her down in the living room and let her be the trophy she deserves to be. Russell is making me a brand new instrument and I’ll have to break her in just like I did Jaina. It’ll be fun but I’ll always be able to come home and see the trophy waiting for me and helping to remind me of the goodness and graciousness that I so do not deserve. As I type this I think of how that last sentence can easily be applied to my children and my wife. We all know the sayings about taking things for granted and it’s sadly true. I always take for granted the things that are most familiar to me. I wish it wasn’t so. But as you and I enter this holiday season, let’s try to look at the familiar “blessings” in our lives and try to see with fresh eyes the graciousness and goodness of God. I’m reminded of that old hymn that says “here I raise my Ebenezer”. Ebenezer means “stone of help” referring to a statue of reminder. Life gets busy, we screw things up, and we trample, experiment, and ding and dent our trophies and forget that they are our Ebenezer’s in our lives. Ooh, that sentence almost brought me to tears. Let’s try to set up more trophies of goodness and grace in our lives. The more we do the more we just might be more goodness and grace to those around us. Fill your living with trophies. After all, we are influenced by most by what we see everyday.